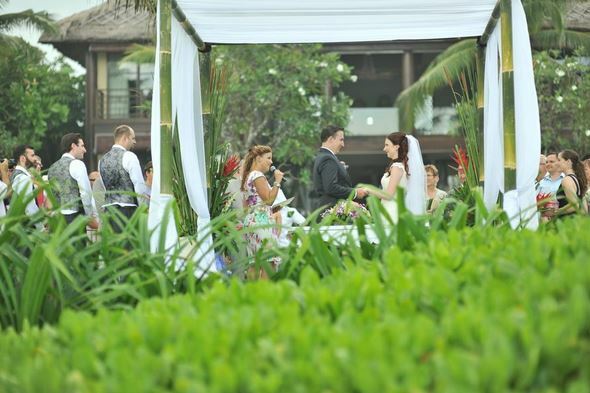 With the average expenditure on weddings in Australia ranging from $38,000 – $55,000, it’s no wonder that couples are looking at places in Indonesia such as Bali to get married. Of the couple that I have assisted from overseas with their destination weddings, it’s been extremely easy to arrange their wedding through Skype and nifty apps such as Whatsapp. Good communication is really important. Essentially local Australian and Overseas couples can enjoy a small (but still intimate) – or big – ceremony is conducted in Australia first. The most relaxed and informal weddings of this nature have been ten minutes in duration and involved the couple, two witnesses over the age of 18 and myself. Simple. The dream ceremonhy has then been formalised in Indonesia. It’s provided the opportunity for them to have their cake and eat it too, plus wedding guests have flown in from all over the world. At the back of the couples mind, they know that their wedding is properly legalised and their actual Indonesian / Balinese wedding is relaxed and sensational. Couples whom I have wed have become fast friends. From onset, there is excitement and trust is built. I will guide each couple – no matter where they are from or what they want – with their ceremony. It could be a wedding ceremony, commitment ceremony, reaffirmation of vows, naming ceremony (this is not just for babies) … you name it. Having lived all over the world and in particular, having direct experience with Asian culture through my ten years residing in Hong Kong, I take enormous pleasure as an Australian-based marriage celebrant assisting couples from all over the world. I will go far beyond the organisation of the wedding ceremony and its legal requirements providing recommendations and advice on venues, transportation, cultural norms and values, attire – essentially if there is something that I can help with I will. If not, I shall provide guidance as to where the support or the service can be rendered. A genuine desire to help couples have the wedding of their dreams, no matter where in the world it is, is my ultimate goal. Marriage in Indonesia is an exciting opportunity for Australians and Internationals alike to experience something different. If you are keen to find out more, please do not hesitate to contact me! CCN Blog: Renewing Your Vows – What’s the Point?